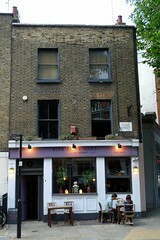 Pub near Sadler's Wells in Clerkenwell. The unique selling point of this pub used to be that it served dim sum (under the name "Old China Hand"), though as of June 2011 this is no longer offered, and all mention of this has been erased from the outside. It spent some time serving Mexican food instead (and hence had a brief change of name to Old Gringo), but switched back to dim sum some time around 2009. It was in the 2007 Good Beer Guide, and it still does real ale. Inside there are two conjoined spaces. There's a ping pong table down the back of the rear room, but the rest of that area (as well as the front, where the bar is found) is laid out for drinking, albeit with rather large chairs taking up quite a bit of space. There are four handpulls for ale, with two available on Ewan's July 2011 visit, both guests (as both changed while he was there): Cheddar Ales Bitter Bully and Orkney Brewery Raven Ale, replaced by Coulson's EPA. All of them were under 4% abv and golden ales, well-kept. There were also some standard keg beers, and an extensive international range of bottled beers with a few British representatives (BrewDog Punk IPA, St Peter's, etc.) and one or two from plenty of other countries, not just the usual suspects. bob visited prior to all this upheaval, at lunchtime in March 2007. The beer was relatively decent. They had Asahi on draft as well as the real ales. The dim sum was pretty good if not a little bit expensive compared to other places. Some of this is explained by the portions being made of four things instead of three and indeed by it not being the New World. I was quite full after having spent about £20. Food was ordered at the bar, via a form which I filled in with the number of each dish I wanted. The decor was quite sparse, with funny wooden tables and chairs (according to the Fancyapint review linked below, as of 2009 these are no more). Last visited by Ewan, Kerry and others, 15 July 2011. Last edited 2011-08-04 23:39:24 (version 17; diff). List all versions. Page last edited 2011-08-04 23:39:24 (version 17).